Preheat oven to 400°F. 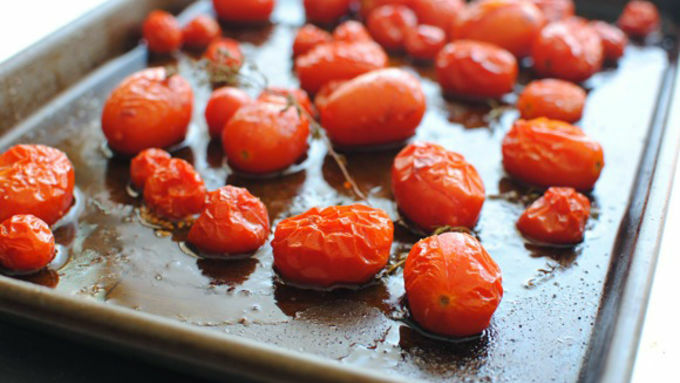 On a rimmed baking sheet, toss the tomatoes with 1 tablespoon oil, garlic cloves, the paprika, thyme and a pinch of salt and pepper. Roast 15-20 minutes, until tomatoes have wilted. Remove from oven. 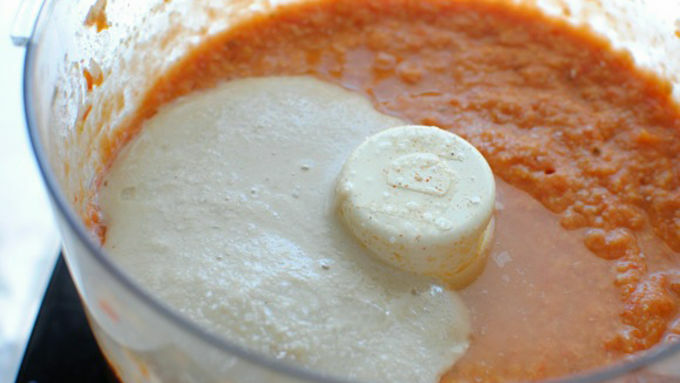 Transfer the tomatoes and garlic to a large food processor. Add the garbanzo beans and pulse a few times. Add the tahini, lemon juice, remaining oil (only if it's too thick) and another pinch of salt and pepper. Blitz until smooth, 5 - 10 seconds. Serve inside a carved-out tomato, or bowl. Have pita bread and veggies on the side for dipping. I wrote you a poem. 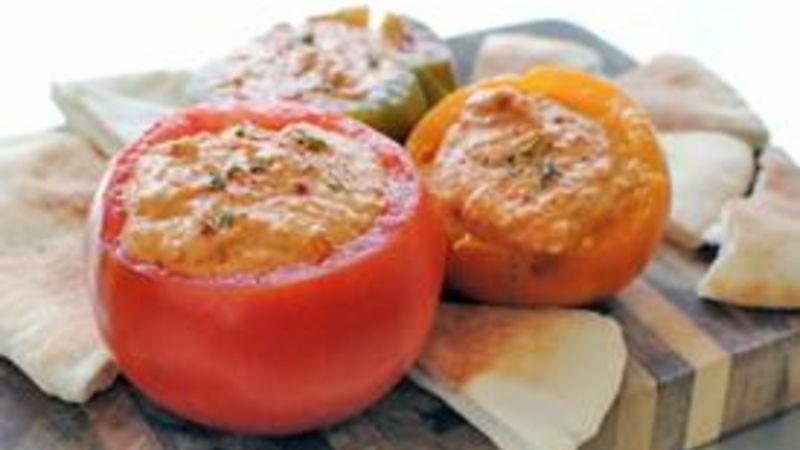 It's about roasted tomato hummus. Ready? All right. The first time I heard the word hummus I felt like such an ignoramus. Who comes up with a word like that? Surely the answer won't fall flat. But then I decided to simply taste it. And just like that, I was hit. Like a freight train in the cold, dark night I was born again, my soul ready to take flight. I've eaten hummus many a time since then. Each moment special, bordering on zen. But this batch in particular has my boats a floatin'. Is batch even the right word? It doesn't matter, for I'm not done a dotin'. Roasted tomatoes and garlic, smoked paprika and fresh thyme. Come together like Santa and the Easter bunny, a combination so prime. Slurp it, lick it, spoon it into your face. By all means don't hold back, for hummus hath found its place. Okay…the laughing hurts, you guys. 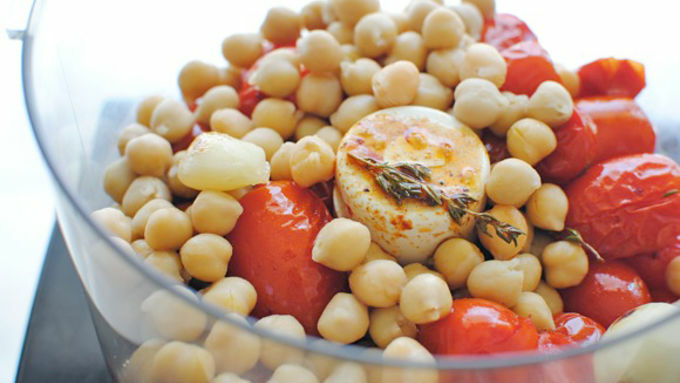 Gather up your ‘maters, some garbanzo beans (chickpeas), tahini, lemon, garlic, smoked paprika and thyme. Let's go! And you can serve it however you like! I thought it would be cute to carve out some bigger tomatoes and serve them inside. You're nodding your head. I know, right? Just make sure to have some pita bread or crackers next to the hummus and Lawdy Lou Missy Sue. Remember the part in the poem about slurping? Yeah. Now you get it. 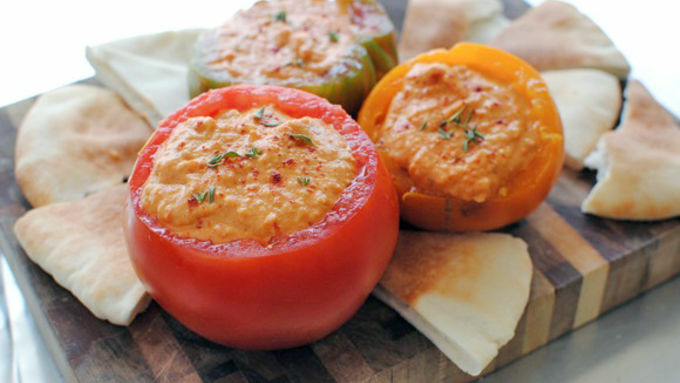 We've got plenty of more dippable hummus recipes perfect for snacking or appetizers.